MPC HomeCinema is comfortable in all plans for the media player. It was built on the basis of a classical player Media Player Classic and one of the best collections of media codecs ffdshow, and thus can play many formats of video and audio files without installing external codecs. This player has a large number of different functionalities: it can play DVD disks, the hardware is able to decode H.264 format popular on the latest generation graphics cards, knows how to work correctly with the second monitor (TV), supports the various type of subtitles can work with QuickTime and RealVideo formats etc. The player is small and completely understandable, and not overloaded functions redundant interface translated into 14 languages. It has full compatibility with Windows XP, Vista and Se7en. 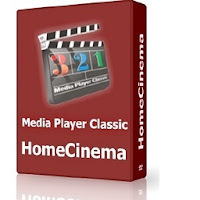 Media Player Classic Home Cinema is an extremely light-weight media player for Windows. It looks just like Windows Media Player, but has many additional features. You can use the player as a Media Player Classic Home Theater. MPEG-1, MPEG-2 and MPEG-4 playback. Media Player Classic is capable of VCD, SVCD and DVD playback, without the need to install any additional software or codecs. It has built-in codecs for MPEG-2 video and codecs for LPCM, MP2, AC3 and DTS audio, and also contains an improved MPEG splitter that supports playback of VCDs and SVCDs using its VCD/SVCD/XCD Reader. A *.mp4 and MPEG-4 Timed Text support added. An AAC decoding filter makes MPC suitable for AAC playback in MP4. MPC Home Cinema also has H.264 and VC-1 with DXVA support, DivX, Xvid, and Flash Video formats is available in MPC HC. MPC can also use the QuickTime and the RealPlayer architectures. Media Player Classic supports native playback of OGM and Matroska container formats. * Option to remove Tearing. * Better support for Windows Vista, including a release for 64 bits platform. * Playback and recording of television if a supported TV tuner is installed. * Creation of minidump when MPC HC crashes. * All features from the Guliverkli MPC Project from Gabest.